The Teaching with Technology Conference was formerly The Teaching Professor Technology Conference. Every year since 2013, The Teaching Professor Technology Conference has brought together educators and tech-savvy professionals to explore effective ways to use technology as a teaching tool. But times and needs change. 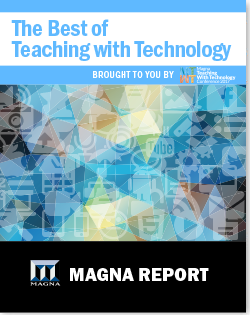 To explore new ways that technology can facilitate teaching and learning, Magna Publications reinvented the original conference as the Teaching with Technology Conference. As the name suggests, the focus of this freshly designed and recharged event is to put the right technology tools in your hands so you can help your students realize their potential. The content and speakers are carefully selected to meet the needs of educators at all levelsfrom beginning teachers who want to use technology in their classrooms to experienced educators who want to get better at incorporating technology to faculty members who are intimidated by technology but want to learn. The most important part of this conference comes down to the same thing that you loved about The Teaching Professor Technology Conferencepeople. Youll mix with colleagues you already know and strike up friendships with others whom youre meeting for the first time. Youll hear how they face the same problems you do and how they found the answers that have worked for them. In short, weve taken the best elements of The Teaching Professor Technology Conference and made them more practical, accessible, and relevant to help educators and their students reach new heights of success.